Chapter Eight: "Heart of Stone"
Adapts "If I Only Had A Heart"
While Arukenimon and Mummymon hatch a new plot involving the balance-maintained Destiny Stones, the confused BlackWarGreymon encounters Agumon, who sets him on the path to discover the meaning of his existence. He is drawn to the site of the first Destiny Stone, which is now under attack from a Knightmon created by Arukenimon, but the DigiDestined soon arrive and engage the villains in battle. Things look bleak for our heroes, but then BlackWarGreymon appears on the scene, sending the villains fleeing. But then, he turns on the Destiny Stone and destroys it. As the kids watch a tornado rip across the landscape, Davis vows that they'll protect the other stones. Adapts "A Chance Encounter," "Cody Takes A Stand" and "Stone Soup"
BlackWarGreymon's continued destruction of Destiny Stones throws the DigiWorld out of balance and sees Digimon appearing on Earth. The kids work to send them back, but the battles take their toll on T.K., and his anger becomes evident to Cody, who turns to Matt for advice and learns of the time T.K. lost Angemon after the battle with Devimon. When protecting another Destiny Stone, Cody faces off against BlackWarGreymon and almost perishes, before T.K. has Angemon save him. The stone is lost to BlackWarGreymon's wrath, but Izzy quickly directs the kids to the final stone, and the race is on to get there first. Paildramon and Silphymon are cut down in the attempt to save the stone, but then T.K. and Cody are able to DNA Digivolve their Digimon into Shakkoumon! Chapter Ten: "Unlocking the Boss"
Adapts "Kyoto Dragon," "A Very Digi Christmas" and "Dramon Power"
Adapts "Digimon World Tour, Pt. 1," "Digimon World Tour, Pt. 2," "Digimon World Tour, Pt. 3," and "Invasion of the Daemon Corps"
The old and new DigiDestined travel all across the globe to round up the wild Digimon that have appeared along with the Control Spires, meeting up and being aided by DigiDestined from other countries in the process, but upon their return to Japan, there is no rest for the weary. Ken is struck with nightmares of his time in the DigiWorld as a child, reports of kidnapped children fill the news, and the vicious SkullSatamon appears in Tokyo to wreak havoc. The new DigiDestined battle him together, but they are all defeated, with each of them being De-Digivolved, except for the paralysed Imperialdramon. The other Digimon give Imperialdramon their energy, allowing him to Mode Change into his Fighter Mode and destroy SkullSatamon. Adapts "Invasion of the Daemon Corps," "Dark Sun, Dark Spore," "The Dark Gate," "Duel of the WarGreymon" and "BlackWarGreymon's Destiny"
As a truck pulls up in front of the victorious DigiDestined, a dark, evil Digimon - Daemon - materialises alongside it, and convinces Ken to enter the truck by showing him its contents: the "kidnapped" children. Ken boards the truck and it drives off, but Ken discovers the kids are not alone in it - also present is Yukio Oikawa, a mysterious man who knows of the Dark Spore that entered Ken's body the first time he was in the DigiWorld. He copies the Spore, but then the truck is attacked by the other DigiDestined and Ken is freed. As Daemon reappears, Imperialdramon enters the fray, and a fierce battle ensues. Dark power swirls in the air around Daemon, but with the help of the other kids, Ken taps into the power of the spore in his body and turns the darkness against Daemon, opening a gate that sends him away. The kids are freed, and Oikawa has vanished - but Cody encounters him soon after outside his home, but is protected from him by his grandfather, who reveals that Cody's father, Hiroki, was Oikawa's best friend as a child. Meanwhile, Tai, Kari and their Digimon investigate Oikawa's home... only to bear witness to the explosive reappearance of BlackWarGreymon! Adapts "Duel of the WarGreymon," "BlackWarGreymon's Destiny" and "Oikawa's Shame"
Agumon becomes WarGreymon, and he and Imperialdramon confront BlackWarGreymon above the clouds. The final explosion sends them all crashing back to Earth, where Agumon tries to convince BlackWarGreymon that the meaning of life is different for everyone. Oikawa, meanwhile, is pursuing his plan with the Dark Spores, absorbing the energy of one of them from one of the kidnapped children into whom he planted the copies he made from Ken's. Cody's grandfather makes him confront his memories of Hiroki, and Oikawa recalls a darkness that came to him from the sky three years before. Oikawa turns the energy he has absorbed on Cody's grandfather, but BlackWarGreymon appears to intercept the blast. He struggles to resist further attacks, but perishes, using the last of his strength to seal the gate to the DigiWorld. Knowing he needs more power, Oikawa gathers all the children with implanted spores together, and absorbs the energies in them to open a gate to a dimension bordering the DigiWorld. The DigiDestined pursue him into the other world, where they watch him destroy Arukenimon and Mummymon and absorb their energies. With that final action, dark energy explodes from within Oikawa, and he is transformed, revealing the truth at last - Myotismon lives again! Final Chapter: "An End and a Beginning"
Adapts "Oikawa's Shame," "The Last Temptation of the DigiDestined" and "A Million Points of Light"
Myotismon, now in the Mega form of MaloMyotismon, subjects the DigiDestined to illusions of their greatest desires. 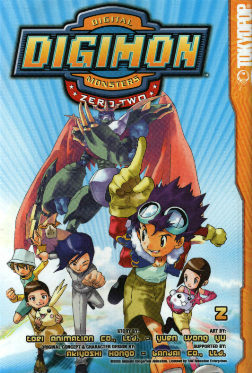 Ken sees his older brother again, but Wormmon is able to make him see the truth, and he breaks the other kids free from their illusions, and they are able to summon enough positive energy to make their Digimon Digivolve into all their separate forms at once. MaloMyotismon, weakened, flees into the DigiWorld, where he gathers more dark power and blasts the pursuing Digimon. All across the globe, the DigiDestined of different countries send the light of their Digivices into the DigiWorld, restoring the Digimon, and giving Imperialdramon the power to summon his Giga Crusher, which destroys MaloMyotismon, freeing Oikawa's spirit. Twenty-five years into the future, we learn the future of all the DigiDestined, the DigiWorld, and the Earth. The cast page retains the "Takakashi" misspelling of T.K. 's surname. Aside from the reorganisation and shortening of some scenes, "If I Only Had A Heart" remains pretty much intact - in fact, it's actually enhanced, as the manga resolves the episode's cliff-hanger where the anime failed to. It features the first appearance of Mummymon's true form in the manga. The events of "A Chance Encounter" are compressed into the first page of chapter nine, showing images of Stingmon's battle with Apemon and Shurimon's battle with Musyamon. Davis summarises events as BWG's destruction of Destiny Stones and the appearance of Digimon in the real world - Sora's father and Joe's brother are not referenced. The events of "Destiny in Doubt" are omitted, as is the destruction of the first stone in "Cody Takes A Stand" - they are glossed over by simply having Davis say BWG continues to destroy stones. "Cody Takes A Stand" and "Stone Soup" are combined into one story - the reinforcements who help defend the second stone in "Cody Takes a Stand" are omitted, as is the entire Digitamamon/soup storyline surrounding the final stone, with it's location being discerned immediately after the destruction of the other stone. BlackWarGreymon does not vanish into darkness, as with the anime - here, Azulongmon takes him into his own light to give him peace. Azulongmon also talks considerably less. The events of "A Very Digi Christmas," bar the final scene - Izzy's discovery of Control Spires all across the world - are gone, although when we see scenes of Digimon in Japan, they are the Digimon who appeared in this episode (Monzaemon, Phantomon, Megadramon, etc.). The early scenes of "Dramon Power" are similarly removed, as we jump straight into Davis and Ken's battle with Triceramon and Mummymon. There's no indication that the original Digimon get their Ultimate Digivolution powers restored - of course, in the manga, there's no indication they even *lost* them. The events of the World Tour trilogy are compressed into three pages, with Davis simply summarising events across the first double-page spread, and some of the individual international DD being introduced on the third page. The original Digimon do not help the new team fight SkullSatamon. LadyDevimon and MarineDevimon do not appear; hence the battles from "Dark Sun, Dark Spore," are omitted. In a notable change from the anime, Daemon is working *with* Oikawa, rather than attempting to steal the spore away from him. When Daemon vanishes, no indication is given that he has been sent to the Dark Ocean, presumably because it has barely been mentioned up until now. Much of both "Duel of the WarGreymon" and "BlackWarGreymon's Destiny" are cut, leaving only Cody's encounter with Oikawa, BlackWarGreymon's arrival and battle with WarGreymon and Imperialdramon, and Oikawa absorbing the power from Noriko's dark flower and destroying BlackWarGreymon. The kids' detective work is gone, Noriko gets no focus, scenes of Oikawa's past are recounted by Cody's grandfather, the scene of Myotismon's entry into Oikawa's body is shown now rather than during the events of "Oikawa's Shame" and the Mega battle is much shorter. BlackWarGreymon arrives at Oikawa's home, rather than a mountain cabin, and the reason that BlackWarGreymon returns to destroy Oikawa is not given. By that same token, the connection between Arukenimon, Mummymon and Oikawa is not explained - indeed, it's barely mentioned, with them simply appearing in his service at the end of chapter thirteen. The pace of "Oikawa's Shame" is picked up considerably, jumping straight in with Oikawa opening the portal. The Key Cards do not appear, and Myotismon's mouth does not appear to give any exposition. Oikawa - under Myotismon's control - is the one who kills Arukenimon and Mummymon, with blades of dark energy, and when the energy that is Myotismon emerges from within him, it actually physically transforms his body into MaloMyotismon, rather than having them exist as two separate beings. We only see Ken's illusion, and it is he who frees the other kids from their illusions, rather than Davis. The power of the dream dimension to make desires and fantasy reality is never gone into, so no real explanation is offered for all the events that are connected with it. Scenes of the Japanese DigiDestined and their families at the summer camp are cut, and none of the DigiDestined - aside from the new team, obviously - enter the DigiWorld. The whole concept of making the spore kids believe in their dreams is gone (that'd make certain members of the fandom happy), and MaloMyotismon's body and spirit are destroyed by Imperialdramon's Giga Crusher. MaloMyotismon's death is also the death of Oikawa - with no previous coverage of the dream dimension's power, it would have been hard to fit in Oikawa's sacrifice, transformation and restoration. In keeping with the fact that Davis has been narrating the entire 02 manga, he too narrates the epilogue, rather than T.K., as it was in the anime. The epilogue is just a sequence of images, rather than any kind of story sequence. The flock of butterflies does indeed appear in the final panel... but you gotta wonder why, since Oikawa didn't transform in the manga. Pleasantly, Ryo is referred to by name in Ken's flashback - not that it'll make much sense to the majority of English readers. Azulongmon's Digi-Core is referred to as a piece of his Destiny Stone by Gennai. Amusingly, in the epilogue, Davis comments that Matt and Sora got married, "weirdly enough." The manga has contained no reference to their relationship up until this point (no room for it! ), so this may be a comment on that - or possibly that the writer of the English Adaptation (who is clearly well-versed in the English anime dub) didn't think much of the pairing.